Did you know that we have a 3D printer on campus that can create real-world objects? Anne Chapin had a problem when teaching about the Venus of Willendorf (one of the world's earliest and most important works of art). Reading about the art object and seeing photos of the ancient sculpture are far removed from the real thing. The projected image just makes the sculpture seem large and monumental. 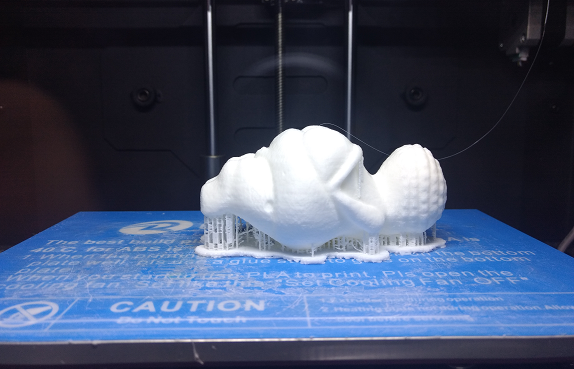 To solve this, Anne used the 3D printer to recreate the Venus of Willendorf. With help from me and Kyle Lusk, she was able to put a perfectly to scale model of the art directly into the hands of her students. If you'd like to have a 3D object printed out for your class, please let me know (brooksjp@brevard.edu). I can help you find and print models that'll meet your needs. Keep in mind that 3D prints take a while to make, so the sooner I know, the better. I'm excited to help more faculty use the 3D printer to put engaging objects in the hands of our students.